Are stretch marks for good? There is no certain benchmark so far to define beauty- Thats what women nowadays are trying make everyone aware of by sharing their 'imperfect' bodies on social media. Nowadays women across the world are widely open for body positivity. It basically aims to eradicate certain beauty standards. Body positive instagrammers came in front of the camera to prove everyone is beautiful under her own skin. They are the proofs that a woman body is just not all about bodies and flawless skins. No woman feels odd or ugly about the stretch marks these days women are bold enough to flaunt their imperfect bodies on social media- Stretch marks especially. For all of them, who do not know that stretch marks do not only represent the mum's post- pregnancy bodies, even models do have cellulite on their body. Many women try to hide these beautiful marks on their bodies. at the same time many woman are taking to instagram to show how having imperfections can make you look beautiful. 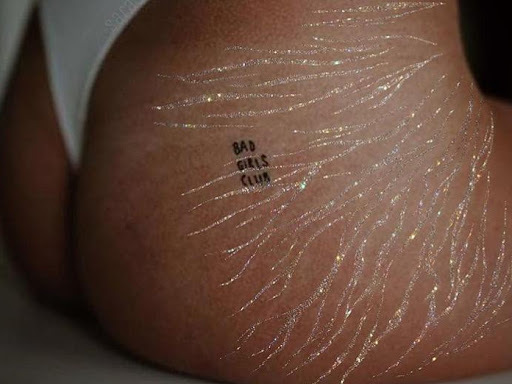 Women are raising their Voice by posting snaps of their stretch marks and cellulite online as they are rallying against photoshopped images that set unrealistic body expectations among the women. As a women her body undergoes many changes during pregnancy. you get stretch marks all over your body.your abdomen, your buttocks, your thighs, calfs, all over your breasts its like the marks are like the mapped lines all over your body. few may find them ugly, few may comment on them. but you cannot get that body back. all you got it was for a beautiful reason of giving birth . It's a beautiful natural thing that you will slowly get used to.. ME.. MY BODY AND MY STRETCH MARKS. Today's world is afflicted with stretch marks , But every frightening story needs a formidable boogeman, and for the story of skin, the big, bad monster is the stretch mark, A pimple has a shelf line, wrinkles appear later in life, but stretch marks- those cankerous streams of broken elastin that pucker plots of flesh- arrive early and stay forever. And oh, they're really ugly.At least thats what we've been told. But it should'nt be that way. A stretch mark is one of life's most common conditions studies estimate that up to 90 percent of pregnat women, 70 percent of adolescent girls, and 40 percent of adolescent males will develop the marks. So ubiquitotous are stretch marks to the human experience that you're more likely to run into someone who has them than you are to encounter a coffee drinker. For especially, stretch marks overwhelmingly appear at times that emphasize femininity wake- puberty and pregnancy. It is the one maker of femininity, perhaps, that escapes the gaze of sociality constructed norms. It's funny then, that something so natural and measured against any other standard, so inconsequential, could strike such a bold spark in the constellation of skin anxieties. History tells us that many of the skin conditions that are vilifies today once illuminated unforeseen health quandaries in more primitive times. Dull skin, for example could lay the signs of internal organ failure; inexplicable rashes, on the other hand, might plot to an infection. There's no beacon in history that clarifies why stretch marks earned their inauspicious reputation. Like any socially driven stigma that's both feckless and irrational, the denouncemnet of stretchmarks began long ago, and naturally, it was directed at woman. There's no need to bury your nose in verse to encounter the global terror of stretch marks in current times. A GOOGLE search churns over 11 million results. The vast majority hammer on chords of fanatical self hate- a compounding legacy of a narrative stacked over a couple of millennia. how to get rid of stretch marks and similiar derivatives draw top SEO rankings on Google's main page. And yet, in sharp contrast to the frezied tenor embodied in these Google results, stretch marks remain virtually invisible within the images we consume the most. Stretch marks are an internal event, rendering topical solutions utterly useless. They form when collagen, the support system for skin, wears thin. layer of the dermis. Because the root of stretch marks are buried beneath skin, only a laser can etch a noticeable difference in treatment. There are multiple lasers on the market today that, when administered by a physician, can address the individual needs of different skin tones (until recently, most lasers would severely damage, or prove ineffective for darker skin colors). The process requires multiple, painful sessions, and even then might only deliver a marginal improvement. But if a stretch mark is the written code on your body documenting moments of growth and maturation, WHY ERASE IT?? Besides , a thing could'nt possibly be that ugly if it's been a part of us all along.